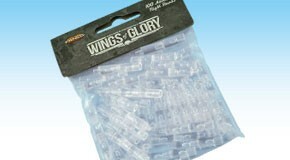 With this Wings of Glory accessory, you will never run out of flight stands anymore. Included in this bag are 100 additional pegs which are used in the game to mark the altitude of your airplane. Whatever the size of your airplane collection, the 100 pegs included in the bag will allow you to get your planes above the normal limit of 4, for use with the â€œFly higherâ€� rules, or to make up for damages or losses.